This belongs to Patience now. Congratulations, Patience Crabstick! 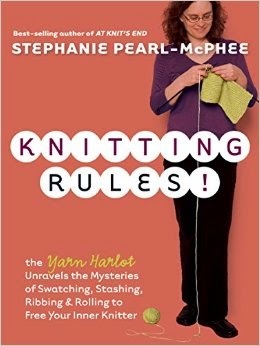 You've won a copy of Knitting Rules by Stephanie Pearl-McPhee, aka The Yarn Harlot. It will be winging its way to you via Amazon as soon as you message me your address (via The More, The Messier Facebook page). Thanks! That was sort of fun. I've got to think what to give away next. Still recovering from my death-defying skiing experience here. Also? Admiring our new thermostat. This is what my life has come to, people - I'm excited to see our bright-white, modern thermostat sitting on the wall, blinking its easy-to-read numbers at me. 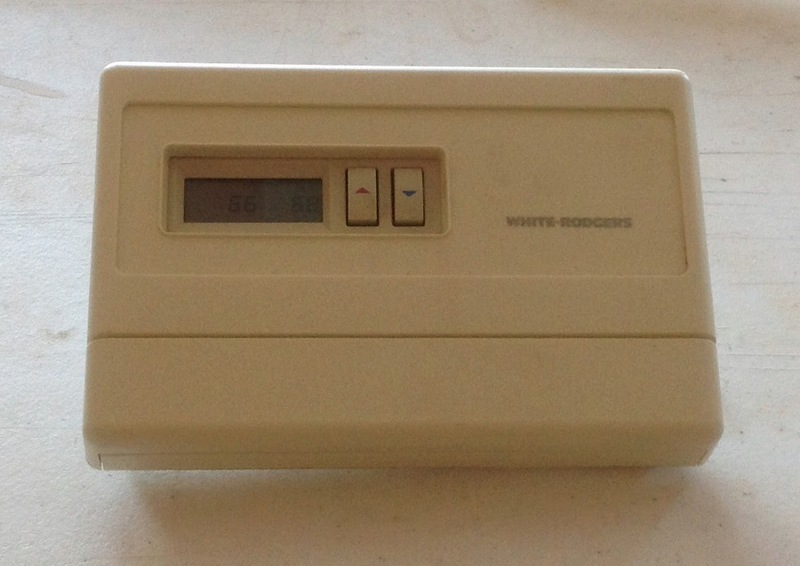 You see, our previous decades-old thermostat was this ugly, very-off-white color and the numbers were well nigh (there it is again!) impossible to see, unless I stood directly in front of it and angled my head just right. I can only surmise that people in the 1980's had both bad taste and wonderful eyesight. My new Honeywell, however, is a delight to behold; and we even moved its location so that we don't have to hunt for it behind the Christmas tree all December. The living room/dining room (remember? Larry's latest demolition project?) is half-painted (one coat) and the electrician arrives tomorrow to install recessed lights in the ceiling. Because of our family's unfortunate tendency to damage lamps, we have never really had adequate lighting in our main living area. Tired of sitting in the dark, Larry and I have decided to live dangerously and pay for lighting that we are not even sure we will both agree is what we want. Lighting that will then be stuck in our ceiling forever, no matter how we feel about it. In fact, it sounds a lot like choosing a paint color, only more permanent and expensive. Pray for us. When we built our house we put in a lot of "cans" which is slang for recessed lighting. I LOVE IT. No muss, no cleaning, just the occasional new bulb replacement which is so easy..
Congratulations! Now I'm just enchanted with the name Patience Crabstick! Ooh, new lights! That's something I would splurge on if we had an unexpected windfall. 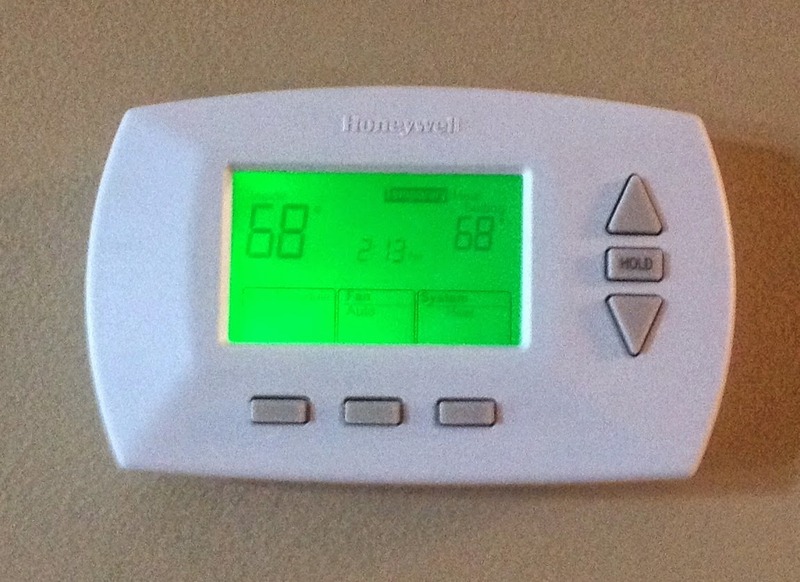 Love the new thermostat. And I know exactly what you mean about the new thermostat... we have one that is easy to read but it was replaced without repainting the wall behind it. I should take a picture of it for you. It will make you so grateful that Larry has taken over the rooms in your house. OMG! I've never won a blog giveaway before! Thanks!!! Recessed lighting is cool. Apparently too cool for our house. It seems that if the lighting is recessed in the ceiling, if you don't like it you can just cover it up.